With Christmas fast approaching and people constantly trying to find weird and wonderful gift ideas we have what you have been looking for. All of our trips come with transport, photos and all specialist equipment. Buying gift experiences with us will be something we guarantee they will never forget. Our trip adviser rating is one of the best in the North of England, so you can rest assured whoever you give the voucher to they will have a good time. Our reviews can be found on tripadvisor here. Gorge Walking in the North Pennines involves sliding down, scrambling and climbing up waterfalls in one of the most picturesque gorges in the North of England. For good measure there are a number larger jumps into deep plunge pools lined with ancient woodlands. 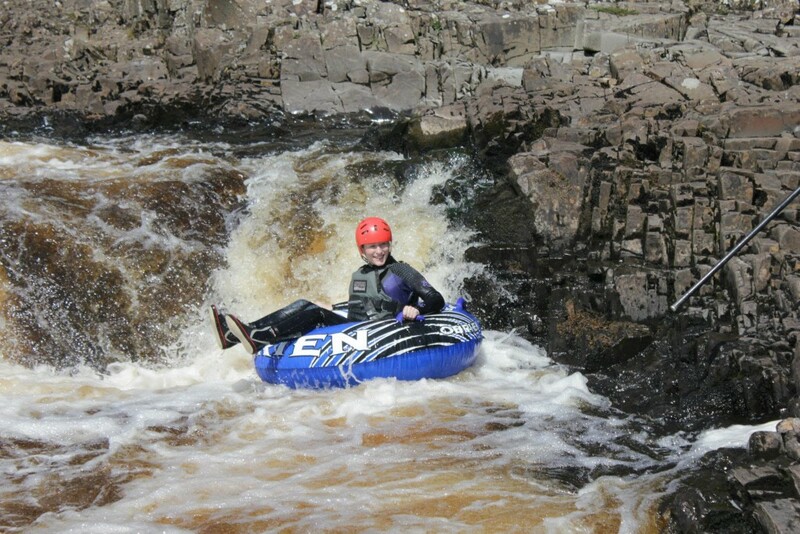 Whitewater Tubing is in upper Teesdale quite close to Barnard Castle. The aim of this one is simple, try and negotiate the class 4 Salmon Leap rapid in your tube. If you make it upright you’ve done well, most don’t! Just before wrapping up the trip we finish with a waterfall jump into a huge bottomless plunge pool. 1: The Extreme involves climbing up the side of Honister pass using a combination of ladders, cargo nets and huge suspended wire bridges. 2: The Classic, still adventurous but not quite as exposed and mostly scrambling on rock is a great way to get to the top of Black Crag. 3: Climb the Mine is inside the mountain and involves wire bridges that cris-cross the cavern and traverse the vertical sides, not for the faint hearted. More info on all our activities can be found here. Most of our North Pennines trips are less than one hour from Newcastle, Gateshead, Sunderland, Penrith and Durham so are very accessible. We take care of the driving anyway in our minibus so you can take in the views. Booking a trip using a gift voucher? Once you have given the gift voucher on that special day. The voucher can be redeemed in three steps. 1:Choose your activity on our ‘availability page’ on the Endless Adventure North East website. 2:Contact us and we will provide you with a booking code. 3:Chose a date and redeem your booking code on our online booking system. Remember if you would like to book for 6 or more we can arrange a bespoke trip for just you and your group.